Remember Hants & Dorset? You now have a chance to relive some of your memories of this former Tilling Group company! We start our journey on board Bristol RELL6G 1652 (XLJ 726K), a 1972 vehicle with ECW DP50F bodywork at Fareham Bus Station. Here we set out to recreate three former Hants & Dorset routes that this type of bus would have operated on. The first is the 53 service to Southampton via the pretty village of Wickham. On arrival at Southampton we change to service 70, a Limited Stop run to Gosport travelling through picturesque Titchfield and Stubbington. There are plenty of atmospheric sounds from the Gardner engine and Wilson semi-automatic gearbox on board. We also have cameras along the route for the scenic drive by shots. We leave Gosport as service 76 back to Fareham. During the filming we have tried to keep to the original routes and locations where possible, but a number of sites have now been demolished to make way for newer buildings. With this in mind, the second part of this programme is archive cine film provided by Bob Gray. 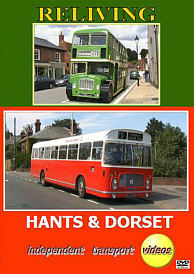 Bob took his camera out between 1971 and 1982 to capture Hants & Dorset buses in service. You might recognise some of the locations in the Fareham, Southampton and Gosport areas from the RE ride, but a lot has changed. Bob also captured two of the Bus Driver of the Year events that took place at Tidworth in 1975 and 1977. Look out for sister vehicle XLJ 727K taking part! He also took two Bristol VRs to the Southsea Spectacular Rally in 1976 and 1977, all is here for you to enjoy. The third part of this programme features Bristol FLF6G 1540 (GLJ 748D), a 1966 vehicle with ECW H70F bodywork. Filmed at the Stokes Bay Rally in 2004, we travel on 1540 as it takes us on a journey to Titchfield via Stubbington. Again plenty of sounds and scenes for you to enjoy. We finish off with a montage of views of preserved Hants & Dorset vehicles in action at Winchester, their home ground, looking the part, reliving the past days of Hants & Dorset. So, if you remember Hants & Dorset, this is the programme for you. If you are too young to remember, take a look and see what you missed! Duration : 103 minutes (approx).